It is not rare to see people facing the problem as “Windows was unable to complete the format” when trying to format an SD card or USB drive. When it happens, people cannot achieve their original purpose that they want to get by formatting the device. The error message is too simple to reveal any information to us that what exactly went wrong and what we have to do to solve this problem. Don’t worry. In this article, you will get the answers. Mistakenly deleting the partition is a common cause of the problem. Viruses, which infect the drive from inside, may keep writing the dangerous stuff on our drive’s programs resulting in it would be inaccessible. Write-protected is also a possible cause because formatting your drive is also a writing process. In this case, you need to remove write protection. Bad sectors on the drive can also be a reason of “Windows was unable to complete the format” error as they interfere with the writing process. Physical damage of the drive is not a common cause, but can also prevent your drive from formatting when it really happens. Though Windows was not able to complete the format in normal way when the above factors appear, we have some solutions to format your drives in other ways. 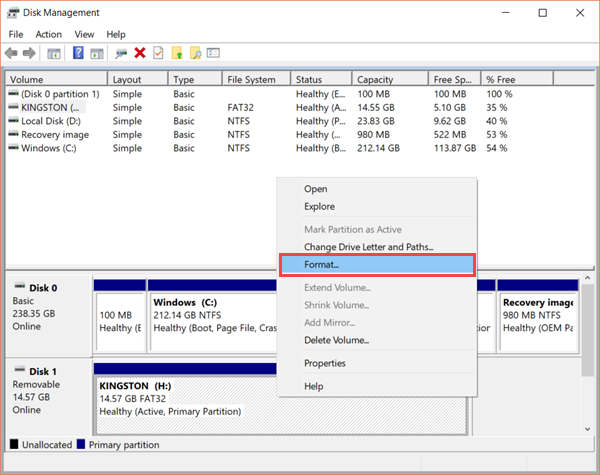 Disk management is a Windows built-in function that allows you to manage all your disks and partitions into the computer. When Windows was unable to complete the format, Disk Management may be able to do that. Formatting your drive in Disk Management requires simple steps. Step 1. Press Windows key + R at the same time, then type diskmgmt.msc in the box and hit Enter. Step 3. Select File system format and other options, then press OK. Disk Management is a very powerful system utility. It should be able to fix the “Windows was unable to complete the format” in most cases. If not, please keep reading the solution below. Unlike Disk Management utility, diskpart is actually a command group. It can force display all disk partitions connected to the computer and perform formatting from higher level, which will help you get rid of “Windows was unable to complete the format” problem with ease. Comparing with Disk Management, diskpart command gives you more authority over your partitions. Please note that the data in the USB drive will be wiped. Step 1. Press Windows key + R, then type cmd in the box and hit Enter. Step 2. Type diskpart in the command prompt window and hit Enter. User Account Control may pop up, just click Yes to proceed. By following these steps your drive will be partitioned and reformatted with FAT32 file system (which is the default file system of most USB drive). Now, you should no longer have Windows was unable to complete the format error. In case you lose important files from SD card or USB drive, it is suggested try a professional file recovery software as soon as possible. Feel free to chat with us if you have other problems when using USB drive, like if you want to fix slow USB transfer speed.